Do you remember the old commercial, I think it was for Solarcaine to stop sunburn pain? There was a little girl in the commercial that was sunburned and extremely red. She said "I got a sunburn and I feel like a french fry"! Some commercials just never purge from your memory. Steve and I stayed on the beach for 3 hours yesterday. I was the smart one and put on sunscreen and Steve was the one who said "Nah, I'll be OK". Guess what? Better still, I'll just show you. Take a look at his red feet. Needless to say, it has been an indoors day for both of us. I didn't get too red but I got enough sun to enjoy one day inside. 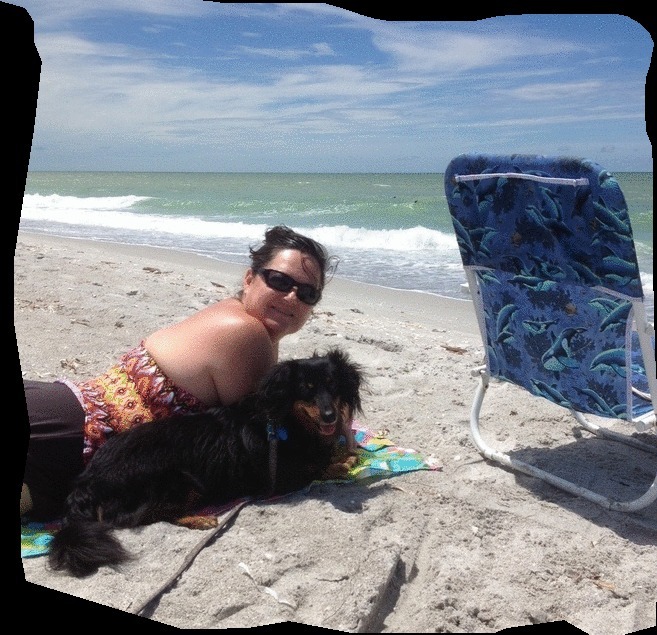 Hermy stayed with us at the beach yesterday, barking at birds and digging in the sand. He is also lounging around today and even though he had a fur coat on, I'm wondering if his skin isn't a bit touchy. I love to pick him up and hold him in my lap like a baby. This morning when I did that, Steve said "Tammy, when the dog keeps shrinking down like that every time you touch him, I think it means he'd rather not be held". I pondered that for a minute and then thought, "He's not snapping at me or giving me his friendly disgusted low growl, so I'm thinking he stills wants his mommy to hold him". 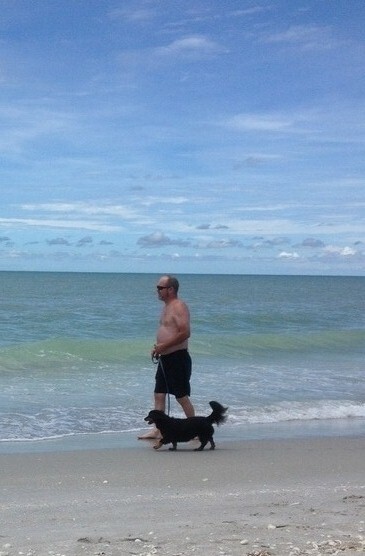 Check Hermy out at the beach with us yesterday. The events in Sanibel the few days have been rather normal. It was kinda sad when the kids and my Mom left, leaving Steve and I all alone in this big house. It's funny how you get used to the kids being gone but you never really get used to them being back. lol I didn't want to see them leave but I did want to get this house back in order which I did immediately after they left! When Sloane comes home from college for the summer, I just put my cleaning duties to the back of the burner because I know that when I remove the dishes from the den, they'll be right back before the end of the day or if I take her clothes to her room upstairs so I can see the top of my dryer, it will be invisible again by the end of the day. I'm sure you have the same turmoil. I would take a messy house full of my kids and their love any day over a clean house lifeless and loveless! Steve did see an egret bird swallowing a snake on his morning stroll with Hermy. We also saw one other unusual thing. Take a look at the pic below. We hope we don't end up like this guy. It may be a little hard to see but it's a frog that may have been challenged by his friends to "step on the cracks break your mommas back". I'm not sure if the air from the heat pump froze him stiff or if he panicked himself frozen stiff. It's puzzling exactly how he got here and how he stays! I'd appreciate it if you would leave me a comment and/or follow my blog especially if you like it! Thanks!